In GGT’s quarterly schedule adjustment, the agency will do as it planned this past summer and cut the long-suffering Route 80, a plodding local bus route that stopped at every bus stop from San Francisco to Santa Rosa. However, Highway 101 service could use more tweaks to better integrate Route 71 and other lines south of San Rafael. New 101 bus service will look like this. Image by the author. 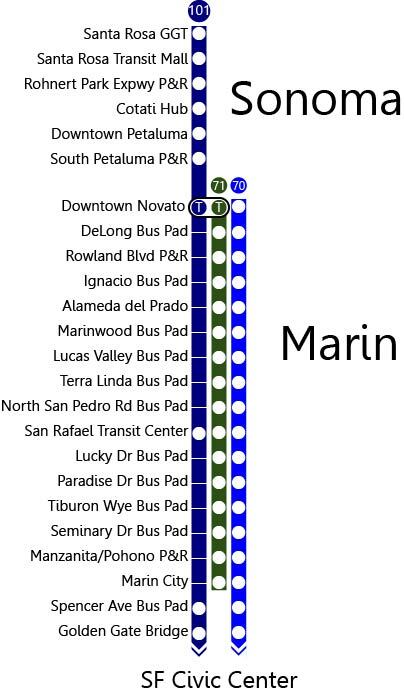 Routes 4, 10, 27, and 101X excluded for clarity. This is similar to Clem Tillier’s proposed Caltrain schedule, with a Silicon Valley Express and San Mateo Local. Unfortunately, the timed transfers aren’t ideal. Before 8:55am, transfers between the 71 and 101 are 6 minutes. After 8:55, they extend to 9 minutes, a hefty chunk of time for riders. A new ferry shuttle, the 37, will run between Smith Ranch Road/Lucas Valley to Larkspur Ferry Terminal in the morning and evening. Though the parking situation is still horrid, it’s good to see the agency is continuing to expand its successful shuttle program. Rerouting the 56 to the Broadway Tunnel instead of North Beach will save time – about 8 minutes per run – which will let commuters sleep in just a little bit longer, get home a little bit sooner, and save the agency about $50,000 in annual operating cost. The largest concern is whether this new adjustment will lead to personnel shortages, which have plagued GGT for the past two quarters. Schedules should meet, not exceed, the agency’s capacity, and adjustments are when any personnel shortages can be smoothed out. While the adjusted Highway 101 service isn’t as smooth as it ought to be, with long transfers and weirdly inconsistent headways between the 70 and 71, the new schedule is overall positive and uncharacteristically bold. As long as this doesn’t lead to more personnel shortages, the new schedule will be a success.